The most valuable commodity in the U.S. Senate is not votes, it is time. Judgeships, ambassadorships, and other key federal jobs go unfilled—not because the nominees lack the 60 votes necessary to move nominations forward—but because the Senate simply doesn’t have enough time to vote on confirmation. Meanwhile, entire cabinet departments function without congressional authority and agencies operate for months at a time without knowing how much money is in their budget. Yet the Senate simply cannot find the time to solve these problems. This logjam is not the result of laziness—the Senate in the current 111th Congress has worked more days than any other Senate in recent memory. Nor is it entirely the result of ideological sparring, although the Senate would not be the mess it is today if a minority of its members were not engaged in unprecedented obstructionism. Rather, it is a monster born from the Senate’s increasingly tight schedule alongside each senator’s sweeping power to run out the clock before anything gets accomplished. Here’s a look at different aspects of this tyranny of the timepiece. Limitless “debate” is the hallmark of the United States Senate. Typically, before senators can vote on a bill or nomination, at least 60 members of the Senate must agree to cease debating the matter and allow a vote to proceed. Thus, a filibuster is nothing more than a refusal to provide the sixtieth vote and allow the endless cycle of debate to be broken. Nor does debate end after 60 senators agree to break a filibuster—a process known as “cloture” in the arcane language of the Senate. Unless the senators unanimously consent to holding a vote immediately, dissenting senators may demand up to 30 hours of post-cloture debate before a vote can actually take place, and they can prevent the Senate from considering any other business during these hours of delay. Thirty hours may not seem like a lot, but when you consider the sheer number of confirmations, bills, and appropriations that the Senate must consider just to keep the country running, the ability to waste 30 hours before any one of these tasks can be accomplished empowers the dissenters to prevent more than a fraction of the Senate’s business from ever being completed. Consider the confirmations process. Excluding judges, ambassadors, prosecutors, and federal marshals, the Washington Post reports that President Obama must fill 526 senate-confirmed positions for the government to operate at full capacity. 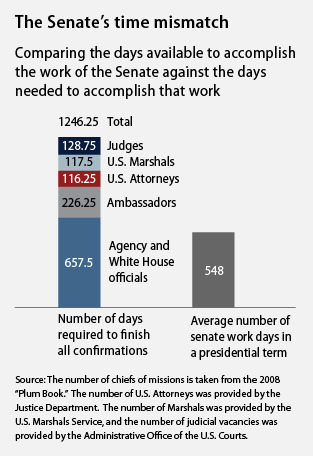 Thus, at 30 hours per confirmation, the Senate would need to spend over 650 days—nearly two years—to confirm each of these nominees, and that’s assuming that the senators work around the clock, on weekdays and weekends, without taking any recesses or holidays and without considering any other business whatsoever (see box). There are 181 senate-confirmed “Chiefs of Missions” leading an equal number of embassies abroad. Confirming each of these ambassadors would require just over 226 days. The 93 U.S. Attorneys would require over 116 days to confirm. Confirming 94 U.S. Marshals would require nearly 118 days. Presently, 103 federal judgeships are vacant. They would require almost 129 days to confirm. In total, this adds up to over 1,200 days and nights required to confirm all of a president’s nominees over minority objection—more Senate work days than there are in two entire presidential terms. For the 100th through 110th Congress, the Senate met an average of just under 137 calendar days every year. Thus, in a typical presidential term, the Senate is actually in session for less than 550 total days. In other words, even if the Senate were to work 24 hours a day on each of those days (which it emphatically does not), and even if the Senate were to consider no other business, there is literally not enough time in a president’s term of office to confirm all of his nominees against blanket obstructionism. Just like Senate “debate” bears little resemblance to actual debate, modern Senate filibusters also bear little resemblance to the dramatic climax of the classic movie Mr. Smith Goes to Washington. Indeed, in many cases, one senator’s mere threat of a filibuster—an action known as a “hold” in Senate lingo—can prevent a bill or nomination from moving forward because that threat carries with it the power to waste as much as 30 hours of floor time. Worse, the Senate’s customs also allow “secret holds.” Just one senator can hold up a bill or nomination, and they do not even need to reveal who they are. Thus, their constituents have no way to know who to blame—and who to hold accountable— when Senate business completely shuts down. To be fair, no Senate minority has ever exercised its full power to obstruct every single presidential nominee under the Senate’s 30 hour rule, but a minority of the current senators have come closer than any of their predecessors. So far, the federal judiciary has borne the brunt of this unprecedented obstructionism. 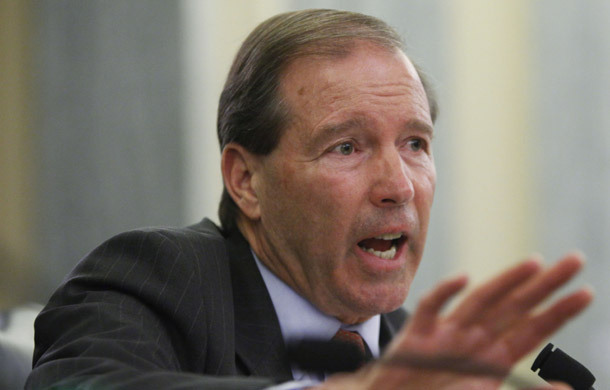 Even many of Obama’s most uncontroversial nominees have suffered needless delays. Conservatives filibustered Judge Barbara Milano Keenan for four months. She was then confirmed 99-0. Judge Denny Chin was also blocked for months, only to be confirmed 98-0. Judge Jane Stranch, who was recently confirmed 71-21, waited over 400 days for confirmation. And these judges are the lucky ones. Many of Obama’s judicial nominees were unanimously endorsed by the Senate Judiciary Committee, but are still being blocked by minority obstructionism. Indeed, the Senate has confirmed President Obama’s district and circuit nominees at only about half the rate of his two predecessors. By this point in his presidency, the Senate had confirmed 98 of President Clinton’s lower court judges, while 77 of President George W. Bush’s nominees wore black robes. President Obama, by contrast, has only been able to get 41 judges past the Senate’s roadblocks. 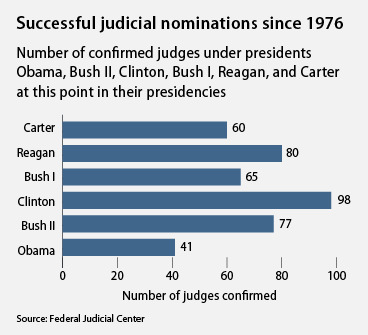 Indeed, as figure 2 demonstrates, the Senate has been slower to confirm Obama’s judges than those of any other recent president (see chart). Admittedly, President Obama has been relatively slow to name nominees. But the rate of nominations does not explain the collapse in the percentage of nominees con- firmed by the Senate. By this point in President Bush’s presidency, 61 percent of his nominees were confirmed, as compared to only 48 percent of Obama’s nominees. The disparity between the Senate’s performance in the Bush and Obama eras is striking when you consider the unusual events of Bush’s early presidency. Indeed, in many ways, the stars aligned against President George W. Bush’s ability to con- firm federal judges. Because the Supreme Court’s decision in Bush v. Gore was not handed down until mid-December of 2000, Bush had a truncated transition period that left him little time to vet nominees. Additionally, the Senate switched from Republican to Democratic control during the first year of Bush’s presidency, unavoidably delaying all Senate business as the Senate completed the administrative steps compelled by such a reorganization. Finally, of the terrorist attacks on September 11, 2001 understandably made confirming new judges a low priority for the grieving nation. Obama presides over a different kind of national tragedy—the economic collapse that he inherited from his predecessor—but Obama decisively won the 2008 presidential election and his party controls the Senate. In other words, absent unprecedented obstructionism, one would expect Obama’s confirmation rate to be unusually high—not the lowest in recent memory. Lest there be any doubt, nominations are hardly the only item of Senate business quietly dying because the Senate simply does not have enough time to consider them. Rather, by the last day of August 2010, fully 372 bills had passed the House during the 111th Congress, but have yet to even receive a vote in the Senate. Very few of these bills received significant opposition in the House. Indeed, a study by the congressional transparency project Open Congress found that only 16 passed the House with less than 60 percent of its Members voting in favor. Fully 44 of the languishing bills passed the House without a single dissenting vote from either side of the aisle. The challenges facing these bills in the Senate even exceed the obstacles facing the president’s nominees. Before the Senate can begin debate on most legislation, the senators must either unanimously agree to consider it or the majority leader must offer a “motion to proceed” to consideration of that bill. This motion, however, can be filibustered—and thus dissenting senators can require up to 30 hours of post-cloture debate after the Senate agrees to break this filibuster. These 30 hours, which occur after the Senate agrees to begin debate, are in addition to the up to 30 hours a minority can require after the Senate agrees to end debate and conduct a final vote on the bill. Thus, in most cases, dissenting senators can force up to 60 hours of delay before a bill may receive a final vote, and they cannot spent these 60 hours advancing any other pending business. The upshot: Passing each of the 372 waiting bills over minority objection could require as much as 930 entire days and nights—more time than there is in an entire congressional term. Historically, federal programs were governed by two separate pieces of legislation. House and Senate committees with subject-matter expertise on that program draft “authorization” bills that define the parameters of such programs; while the less specialized appropriations committees actually decide how much money each program has to spend. The implications of this failure to authorize federal programs are twofold. First, although the House and Senate Appropriations Committees sometimes compensate for the absence of authorizing legislation by inserting programmatic instructions into appropriations bills, these committees are ill-equipped to make these kinds of judgments. Authorizing committees have specialized knowledge in the handful of agencies that they each oversee, but the Appropriations Committee must oversee the entire federal government. As a result, appropriators are stretched very thin, and are all too often called upon to make decisions that are better addressed by lawmakers and congressional staff with particular expertise. Additionally, depriving authorizing committees of their power to enact and amend authorizing legislation undermines effective congressional oversight. This is because an agency’s willingness to cooperate with a congressional committee is directly related to that committee’s ability to punish the agency for noncompliance. Without authorizing legislation, only appropriators have significant power to apply pressure to federal agencies, but overburdened appropriations committees are unlikely to have the time to monitor every single federal program without help from authorizing committees. If project managers, contract officers, or grant administrators get their budget at the beginning of a fiscal year in October, then they have a full 12 months to publish solicitations for grant and contract proposals, appoint reviewers to select proposals that give the taxpayer the greatest value, draft contracts that protect the government’s interests in the timely and effective performance of work, and consummate those contracts. Conversely, agencies that are deprived a full year to complete these time-consuming processes are forced to find shortcuts such as no-bid contracts and less-rigorous reviews. Government contractors can make out like bandits from a delayed appropriations process, but the taxpayers are left holding the bag. Senate obstructionism is worse now than it has ever been. The result: Our country is grinding to a halt. Many of the right wing’s present tactics—such as widespread filibusters of uncontroversial nominees—are entirely unprecedented, yet the Senate’s inability to complete routine business is nothing new. For years, Congress has failed to provide the most basic guidance to federal agencies. And the problem is likely to continue if long-overdue steps are not taken to encourage swift action by the United States Senate. In fact, the real surprise is not that the Senate is currently paralyzed by a time crunch. The real surprise is that this crisis did not emerge sooner. So long as unanimous consent—all 100 senators—is required to move Senate business forward in a timely manner, it will remain far too easy to abuse the Senate rules and bring progress to a standstill. Ian Millhiser is a Policy Analyst with American Progress.